The last few weeks we have been examining photographs from The American Colony and Eric Matson Collection. The pictures have ranged from Lower Beth Horon to Gerasa, from the damming of the Nile to the flooding of the Jordan, and from the interior of Barclay's Gate to the Locust Plague of 1915. We are indebted to the work of the American Colony and Eric Matson for these photographs. This week we will focus briefly on the American Colony itself. The American Colony started as an American religious group that migrated to Jerusalem in 1881 under the leadership of Horatio Spafford, author of the well-known hymn "It Is Well with My Soul." This group was known for charitable work throughout its existence. In 1896, a significant number of Swedish immigrants joined the group (again, for religious reasons) and the group was able to develop some projects that provided some consistent income for the community. The photography department became especially lucrative when the group was granted special permission from the German government to photograph the trip of Kaiser Wilhelm to Jerusalem in 1898. Due to their coverage of that trip and the use of their photographs in newspapers around the world, the photography department earned recognition worldwide. In subsequent years, the photographers of the American Colony went on several expeditions to capture pictures of various peoples and places. For example, the photo below is from an expedition to Egypt, and captures what was surely one of the highlights from that trip: an American Colony photographer is standing near the top of one of the pyramids of Giza readying his camera and tripod. The photo was taken sometime between 1900 and 1920. There was a split within the American Colony in 1930, and at that time the photography business was handed over to one of the members of the photography staff: G. Eric Matson. Matson kept the department going until 1934 when he and his wife left the community. Then he started his own business called the Matson Photo Service. 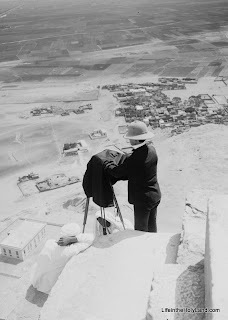 He continued to add new photographs to the thousands of pictures that the American Colony had collected over the years. 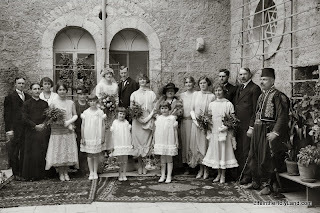 Below is a picture of Matson and several others from the American Colony on the day of his wedding in 1924. In 1946, Matson and his wife moved to America bringing most of the collection with him, and in 1966 he donated the whole collection to the Library of Congress. Finally, in the early years of the 21st century, digital copies of the American Colony and Eric Matson Collection were collected, edited, and organized by a Bible teacher named Todd Bolen, with the help of some faithful friends. Bolen's edition of The American Colony and Eric Matson Collection is available for purchase at LifeintheHolyLand.com. These photographs, along with over 250 others, are available in Volume 8 of The American Colony and Eric Matson Collection which can be purchased here for $15 with free shipping. This volume of the collection features various people that lived in the Holy Land during the early 20th century: Arabs, Jews, Christians, Bedouin, and many others.